I read an interesting article that outlines why minor waiver/release agreements should be used even if a particular state’s court system has ruled against their enforceability. The article also includes innovative provisions that should be inserted into the language of the waivers/releases. A minor is not considered to be a legally competent party to enter into a binding contract such as a waiver/release agreement. Therefore, their enforceability is dependent upon the minor’s parent(s) waiving rights on their behalf. The case law of the state may change. The waiver/release may have a psychological impact to deter litigation. The organization requiring the waiver/release will be no worse off, even if it is not enforceable. The risk warning provision in the waiver/release may provide evidence for an assumption or risk defense. A provision that the governing substantive law will be based on a state where parental waivers are upheld. 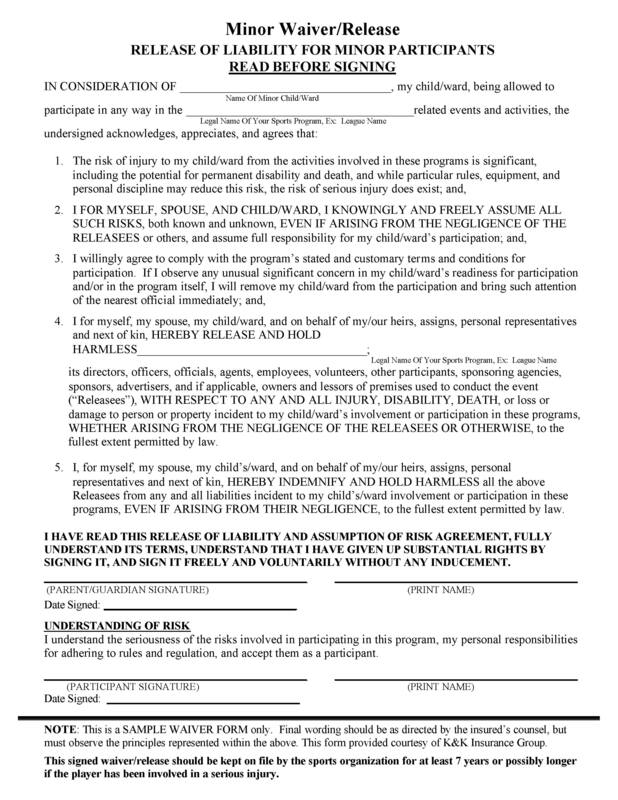 A parental indemnification agreement where the parents agree to indemnify the sports organization for legal defense and damages that are paid on behalf of the injured minor. Find out if a waiver/release is worth the paper it’s written on. Florida’s Supreme Court has ruled that parent cannot execute an injury liability waiver for a minor child when the liability release involves participation in a commercial activity, as opposed to a community or nonprofit activity.According to the court, if pre-injury waivers were allowed for commercial establishments, the incentive to take reasonable precautions to defend the safety of minor children would be eliminated. Florida is one of about 10 states that currently recognizes a parental waiver/release for purposes of contractual exculpation and lawsuit dismissal upon summary judgment.This case is narrower in scope and does not impact the successful use of waiver/release agreements for minors in non-commercial settings such as private leagues or municipal recreation departments.